My search for interesting salads makes me adventurous, and often gives surprising results. The Avocado fenugreek leaves salad with feta cheese and a pomegranate honey lemon dressing, was actually discovered accidentally. It all started when I had to use methi/ fenugreek leaves in the weekly Monday post (more about that, below). I also had to make my salad for lunch. Looking around for ingredients, I saw that the avocado I had kept for ripening had turned a pretty red. When sliced it tasted surprisingly perfect. Very often they don’t ripen but turn a dull brown or black and rot away, going straight from unripe to overripe. This time I was lucky and so, added them to the salad. The methi leaves were washed and dried in the salad spinner. Fresh feta cheese and pomegranate arils, a handful of roasted peanuts, and the salad was ready. All I had done was use whatever ingredients I had on hand! Next I had to think of the appropriate dressing for the salad. My first inclination was my strawberry dressing, which is both sweet and tart. Then my eyes fell on the pomegranate juice, left over after I removed the arils for the salad. I could have used juice from a carton, but I had the one tablespoon I needed, right there. 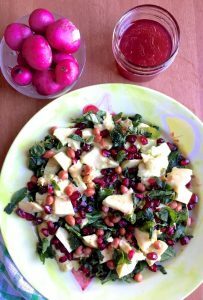 A large dose of honey, some fresh squeezed lemon juice, olive oil, and there, the pomegranate dressing was ready. The theme for the 177th Foodie Monday Blog Hop is ‘Magic of Fresh Methi Leaves’. I often have a salad with bread or soup for lunch. Instead of using the methi leaves in an Indian recipe, therefore, I decided to make a salad. I like the taste of bitter greens such as arugula or chicory in salads, and thought the raw methi leaves couldn’t be far different. Happily, the creamy avocado and the sweet pomegranate dressing with honey and lime juice, completely disguised the bitter taste of the fenugreek leaves. The avocado fenugreek leaves Salad tasted really good, what with the feta cheese, the just ripe enough avocado, the methi leaves and the pomegranate. 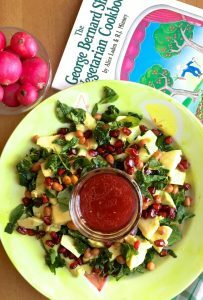 The pomegranate honey dressing was delicious and took minutes to make. Roasted peanuts gave a crunch to the salad. Adding a little cooked couscous or brown rice or dalia would make this a complete meal, though I found it filling enough because of the avocado. Ideally, you should make this avocado fenugreek leaves salad just before meal time. It is very quickly put together if you have all the ingredients ready. Slice the avocado only when you are preparing the salad, and even then, drizzle lemon juice on it to prevent discolouration. This post has been sent to the event 177th Foodie Monday Blog Hop, with the theme ‘Magic of Fresh Methi Leaves’. The theme was suggested by Sasmita. Sasmita blogs at First Timer Cook. Do visit her blog with its variety of innovative recipes, from healthy to vegan to nourishing grain based recipes. Theres something very attractive about a bright pink bowl of roasted beetroot hummus. 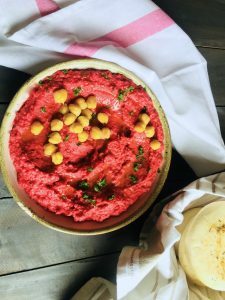 It manages to look and sound exotic even though its just plain old beetroot which has been roasted so that its flavours come through, peeled and tossed into the processor with the usual ingredients for hummus: chickpea, tahini, garlic, seasonings and olive oil. Its amazing though how much the roasted beets enhance the flavours of the hummus. This Roasted Beetroot Hummus ticks all the boxes for a great food item: Appearance (gorgeous! ), Taste (Yum! ), Nutrition (its Beetroot and chickpeas right? And its got parsley too! ), Ease of making (easy peasy); its vegan, its gluten free. Its not quick though as the chickpeas are soaked overnight and and then cooked. And the beetroots need a good half hour- 45 minutes in the oven. But your active time making the hummus is not much and the process is real simple. A beginner in the kitchen could turn out the roasted beetroot hummus without stress. 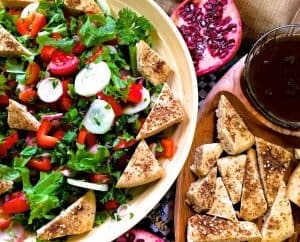 Just set out your ingredients and follow the steps in the recipe, and you are home, with a pretty looking dip all ready for serving with crudités or toasted pita bread sprinkled with za’atar. 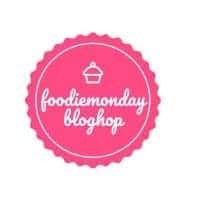 This week, I suggested the options for the theme for the 167th Foodie Monday Bloghop, viz, a breakfast dish, cooking with grains (other than rice) or a root vegetable (not being potatoes). The majority vote from the members was for a root vegetable, so here we are, Rooting for Roots! I had store bought pita and was planning to make regular hummus, but once the theme was set, decided to make the beetroot hummus instead. I added parsley and a touch of cumin to the roasted beetroot hummus and it turned out delicious. 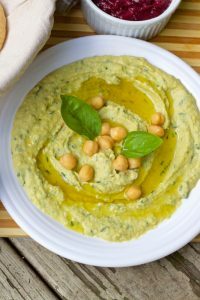 When making the hummus, I followed Yotam Ottolenghi’s guide to making a great hummus: soak the chickpeas overnight with a teaspoon of baking soda, drain and rinse it the next morning, and cook it till the chickpeas and soft and just falling apart. 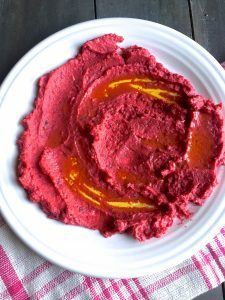 I don’t remove the skin from the boiled chickpeas, but you could do that to get an even softer texture to the roasted beetroot hummus. Note: The cooking time below reflects simultaneously cooking the chickpeas and roasting the beets, plus additional time for processing the ingredients into hummus. Yes, its Yotam Ottolenghi again. I have had his Plenty Cookbook on my brain the last few days, and have been sighing over these super delicious recipes . Thanks to my little balcony herb garden, I had all the makings for his Crusted Baked Pumpkin -except that I didn’t have pumpkin! There was however this gorgeous small Butternut squash that I got at Namdharis’ last week. 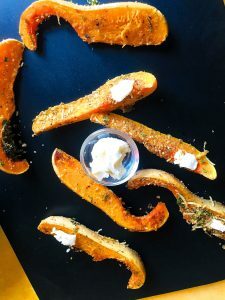 I had broccoli carrot soup just made today and these baked wedges of squash were the perfect accompaniment. 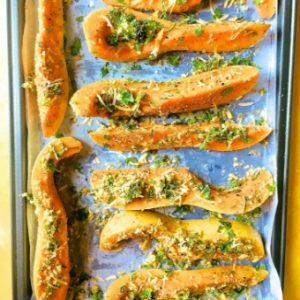 Voila (or something like that) – here’s my recipe for Baked Squash crusted with Parmesan and Herbs. 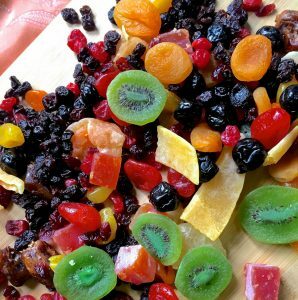 This post is a detailed guide on How To Soak Fruits for Christmas Fruit Cake. 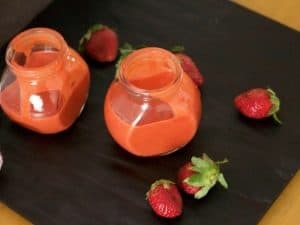 The choice of fruits and the proportions in the recipe below are similar for soaking in alcohol or in an non alcoholic liquid, and I have given the steps for both types (the timelines for a non-alcoholic liquid are given at the end of the write up to the post). The timelines do differ, as well as how to preserve the fruits for the cake till it is baked. If you do not want to soak the fruits ahead of time, I have given a short-cut method in the recipe for baking a Christmas Fruit cake. This is a step by step guide to making a rich Christmas Fruit cake. Do read the Steps as well as the tips given just below the history of Christmas Cakes here, before you move to the recipe. This will help you plan for soaking fruits as well as for baking the cake. For a recipe on making an Eggless Christmas Fruit cake, click here. 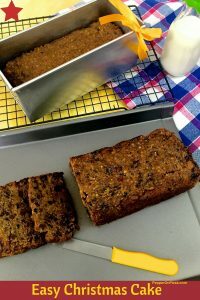 After posting my guide on how to soak fruits for a Christmas Cake I have followed up with this recipe for baking the rich Christmas fruit cake. Last year I had soaked the fruits in the 3rd week of November, and by the first week week of December it was time to bake the cake, giving a little time for the cake to mature. This year I will try to soak the fruits earlier, in September or October. This recipe is for a rich Christmas Fruit cake, though it tastes so good, I might just make it several times a year. No more buying dry plum cakes from the local bakery! If you are going to try this recipe, the first thing you have to remember is that you either soak the dry fruits ahead of time (here’s the link to my recipe for soaking the fruits) or at least start the preparation for making the cake a day before you plan to bake it – check in Step 1 below. The quantities here are for one rich Christmas Fruit cake though I have actually made 3 small cakes – 2 with fruits soaked in rum and one little round one with fruits soaked in orange juice, for my little granddaughter Natasha. I made the batter for the cake and then separated a small quantity for Natasha’s orange flavoured cake. For a little bit of Fruit cake history – Wikipedia says that some of the earliest known recipes from ancient Rome had pomegranate seeds, pine nuts and raisins all mixed into barley mash! Later on, in what are called the Middle Ages, honey, preserved fruit and spices were added. The recipes varied from one country or region to another, down the ages depending on availability of ingredients locally as well as local customs, church regulations not permitting the use of butter during fasts, etc. Wikipedia goes on to say that Pope Innocent VIII (1432–1492) finally granted the use of butter, in a written permission known as the ‘Butter Letter’ or Butterbrief in 1490, giving permission to Saxony to use milk and butter in the North German Stollen fruit cakes. It was only in the 16th Century, that the awareness (and availability of sugar from the Colonies) that high concentrations of sugar could preserve fruits) created candied fruit, thus making fruit cakes more affordable and popular. Now lets go on to our rich Christmas Fruit cake! There are some preparations to be made before you can actually get to baking the cake, if you want to bring out the best flavours and rich moist softness of the cake without having it brown and burn on one side and remain sticky on the other. 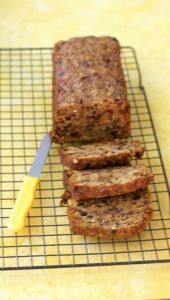 This recipe is for a traditional rich Christmas Fruit cake, but if you have not soaked the fruits ahead of time, there is a short short cut which you could try – the intense flavour of well soaked dry fruits would not be there, but you would get a nice Christmas fruit cake anyway. The day before you are going to bake the cake, set the soaking liquid in a saucepan on the stove on low flame. Add the dried fruits and bring the mixture gently to a simmer, keeping the heat low so that the liquid does not boil away. Turn the fruits with the liquid into a bowl, stir it well, and once it cools, cover and keep in a dark cool place. 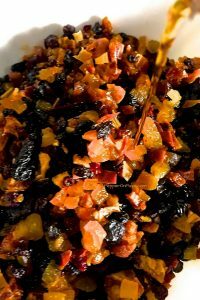 For quantities of fruit and soaking liquid, check my recipe on this blog for soaking fruits for the Christmas Cake. Soaking liquid: You could soak the dry fruits in alcohol (brandy, rum, cognac, etc) or in unsweetened fruit juice. For Natasha’s little cake I used freshly squeezed orange juice. A combination of orange and cranberry juice or apple juice would be good too. Black tea such as a Darjeeling tea, pre-soaked in cup of very hot water, could make an effective non alcoholic substitute. The dry fruits and nuts are the hero in this cake, The flour, butter and eggs are put to use to hold the fruits together and shape the cake. Step 2: Preparing the Baking Tin : The recipe below is for an 8″ square tin, or a 9″ round one, or you could bake the cake in smaller tins or a round bundt tin. The Christmas cake is to be baked on low heat for a long time, so that it cooks evenly without burning. It is important to line the baking tin with parchment paper or grease proof paper. I did not have brown parchment paper so I used the white one, but I have heard that brown parchment is of more use in keeping the cake sides and bottom from browning too fast or burning. Grease the tin all around and use 2-3 layers of the parchment paper, lining the bottom and all sides of the tin, with an inch or two of paper protruding from the top of the tin on all sides. Some bakers suggest wrapping the outside of the cake tin too, with brown paper and tying it in place, so help ensure the cake does not overcook. Check the list of ingredients below for the rich Christmas Fruit cake and ensure you have brought them all, specially the eggs and butter, to room temperature. You may even need to keep the butter out overnight for it to come up to room temperature, depending on the climate. Measure all the ingredients and keep them ready. Mix the spices in the proportion given in the ingredients below. Grind the almonds in a processor (unless you are using processed almond flour). Measure the flour and then sieve it along with the baking powder so that the baking powder gets dispersed into the flour. Chop the walnuts into small pieces. Step 4: Bake the cake: When you are ready to go, set the oven to preheat at 160 deg C (320 F). Prepare the batter as per instructions in the recipe below. As the cake bakes, the liquid in the fruits oozes out and givens the Christmas Cake its moist, soft texture. This is a crumbly cake but if you bake it correctly you can slice it cleanly. Using alcohol to soak the fruits for the cake is of course optional. The alcohol in the cake evaporates during the baking, however it leaves its flavour behind. As there would still be some residue in the cake, it would not be advisable for expectant mothers or children. Molasses or Syrup: I have used dark molasses in the cake. You could substitute with treacle which is traditionally used in Christmas cakes, and if you don’t have either, use maple syrup or dark honey. The flavour would differ for each of these. Nuts – I readily had available walnuts and almonds, and the almonds make a nice flour when ground which adds to the texture of the cake. Pecan nuts or hazelnuts or a combination of nuts could be substituted for the walnuts, in the same proportion as in the ingredients list below. Zest: I have put both orange and lemon zest in the ingredients, to give the cake a lovely citrusy flavour. Whether you use only lemon or both is your option to choose. Be gentle with the Batter Don’t mix or beat the batter more than required for the ingredients to just combine, as the cake would become heavy. Gently fold in the ingredients. BakingTemperature and Time: Oven temperatures vary, so you need to keep checking your cake after an hour and a half. When a small skewer inserted comes out clean or with a few dry crumbs, your cake is done. I started my oven at 160 C and after an hour when I saw that the top looked set, I brought the temperature down to 150 C. It took about 2 hours and 15 minutes for my cake to get done. Storage: I have given the steps for storing the cake after baking, in the instructions below. Do not wrap the cake directly with foil as the alcohol or juice could react with the foil. Wrap in clingfilm and then in foil.The cake is not be refrigerated as it could harden and the sugar in it crystallize. The alcohol in the cake acts as a preservative. I have not decorated the top of the rich Christmas Fruit cake, as it looks good as it is. I may do so before Christmas, though – a simple decoration of sliced almonds and sliced candied cherries, maybe. Next year I may cover the cake with icing in Christmassy theme. If you have been following the recipes on my blog, you would know by now that I enjoy fresh salads and that too with tailor-made dressings that I plan for each such salad. 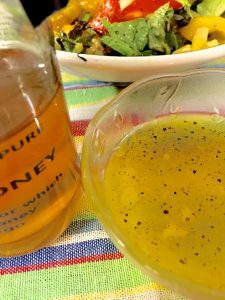 This is one of my staples, an easy to make Honey Lemon Salad Dressing. Takes less than 10 minutes to put together, and another 10 minutes to chill in the fridge, while you make your salad. The jar of totally delicious and unprocessed, raw and natural honey that was delivered by Sakura Fresh and First Agro Farms, naturally set me off to experimenting with different honey based salad dressings. A Honey Lemon Salad Dressing would fit the bill for most of the salads which form my daily lunch. The first of their various exotic honeys that I tried, was this golden Kumaon Honey. The Sakurafresh website explains that this honey is collected from wild flora of the Foothills of the Himalayas. Exotic indeed! The website also goes on to say that the Kumaon Honey they supply is rich in antioxidants and is a great energiser. Another easy to make salad, with a tangy dressing to complement the sweet peaches. Make this delicious Honey Grilled Peach Salad with Feta when fresh peaches are abundant in the market. It takes very little time and effort and is bursting with nutritious colours and flavour. The first time I made this Honey Grilled Peach Salad with Feta, my fridge was full to the brim with veggies and fruits. First Agro Farms had delivered their signature zero pesticide greens and herbs including fresh lettuce, arugula, chard, scallions, as well as chives, oregano and parsley, as well as tomatoes of various colours and degrees of ripeness. There were peaches and plums from Namdharis and a variety of cheese from Natures Basket. I usually add fruits to my salads, and honey either in the dressing or as in this case, drizzled on the fruit to be grilled. Colours, textures, flavours, tart and sweet – you have them all in this perky bright little salad. Roasting the figs and sweet peppers enhanced their flavours. I came across these small round sweet juicy oranges, one of which I deseeded, chopped and added to the dressing: pulp, juice and all. A herb infused goats cheese and some ripe plums contrasted with the lettuce, tomatoes and peppers. Crunchy toasted walnuts for a bit of bite, and a dressing with Zing in it! Served with thin warm slices of your favourite bread, this, Roasted Figs & Tomatoes salad with fresh greens, is a whole meal by itself. A tangy dressing offset by the pomegranate in the salad. Shredded fresh green lettuce, chunks of red, yellow and green sweet peppers, firm green and orange tomatoes and sharp red radishes along with scallions sliced fine and a scattering of tiny pieces of shelled walnut, give this salad its medley of colours, textures and flavours. Perfect for lunch on a hot summers day, a gorgeous Salad of Radish Tomato Raw Mango, with its contrasting flavours somehow coming together with the dressing of orange juice, lemon juice, ginger, chilli and olive oil. © Sujata Shukla and PepperOnPizza.com, [2015 to 2019]. Unauthorized use and/or duplication of this material or any part of the content, including but not limited to Recipes, Posts and Images, without the express and written permission from this site’s author and owner is strictly prohibited. Full recipe is not to be posted – Excerpts and links may be used, provided that full and clear credit is given to Sujata Shukla and to PepperOnPizza.com with appropriate and specific links directing to the original content.